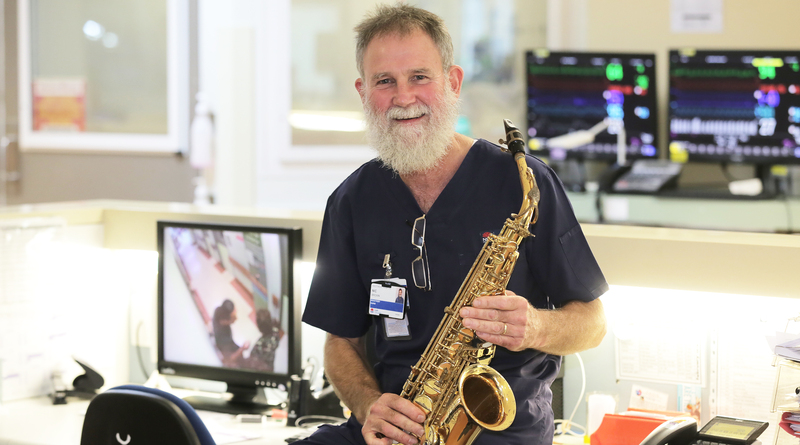 Westmead Hospital ICU nurse Nic Brown combines his passion for music and helping people with his band Ministry of Rock. Over the decades he has consistently turned to a few sources of comfort on the tough days: his wife, his faith, and his music. “Playing music is really good downtime,” Nic said. Nic said he has “always” been into music but it was 1979 when he first picked up the saxophone, and 15 years ago when he met fellow musician Geoff Darvas. After years of talking about it, the pair finally decided to “get the band back together” and formed their new project Ministry of Rock in early 2016. Ministry of Rock played to support Hornsby Ku-ring-gai Women’s Shelter last month – don’t miss Nic nailing the riff to ‘Cry In Shame’ by Johnny Diesel & The Injectors at the end of the video. The band plays an array of Australian rock classics, covering old favourites from the likes of The Angels and Cold Chisel, but with a twist: they do it all for charity. “We’re all from different churches around town and essentially our premise is: we’ll come and play for you for nothing, if you give the money you would’ve given to us to someone else,” Nic said. “It’s a way of giving back with the gifts we’ve been given. On performance day, it is a lot of hard work – probably 12 hours of work – that you don’t get paid for. But it’s worth it. Nic said the late nights with the band often involve a “Maccas coffee” on the way home. Nic tries to keep up with modern music through his sons, but admits his musical ability “stops around the early 2000s”. And his favourite to play? “Midnight Oil is always good. A lot of good work in there for horns sections,” he said. Nic has been with the Westmead Hospital intensive care unit for 13 years now, and he says the hardest part is not hearing back from patients after they get transferred to another ward. “I enjoy lots of things but mostly I enjoy working with the patients and working with the families,” he said. If you’d like to work for Western Sydney Local Health District, you can view our employment opportunities here. Make healthy your choice in 2018! 22 Jan, 2018, 11:17 am Jenny Harrison Comments Off on Make healthy your choice in 2018!